Lola has always been her family's port in a storm, but she's hiding the hurtful reason she left Ireland as a young woman. Lola's walk down memory lane will force her to confront her bittersweet past - and discover that the truth can indeed set you free . . . 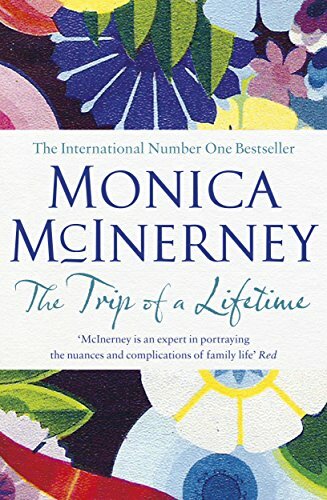 The Trip of a Lifetime is a moving story about the light and dark times of life, and a colourful, big-hearted family you'll want to call your own. This was such a beautiful, charming story. The characters were so very real and human that it felt like I was visiting old friends and catching up. Every family is complicated, probably with more than one skeleton in the closet whether they admit to it or not and Lola's story is something that will touch a chord with many readers. This book will have you laughing and holding back the tears as you follow Lola down memory lane. Modern Ireland is excellently portrayed, mostly through the eyes of Lola who was able to see what had stayed the same in her old neighbourhood and what had changed in the past sixty years. There are no lazy stereotypes of Ireland. The characters in this book are brilliantly written. Lola is eccentric and formidable. Her granddaughters are clever and funny. I especially loved the overly enthusiastic and friendly chauffeur they hired in Ireland. I found this book difficult to put down and thoroughly entertaining.